In the late 1960s, Quicksilver Messenger Service occupied an unusual position in the pantheon of major San Francisco Bay Area psychedelic bands. Not that most of those acts weren't unusual, even in relation to each other. Part of what set Quicksilver apart from their peers, though, was that they were not so much singer-songwriters as they were virtuoso players and creative interpreters and stylists. They were not the greatest of vocalists or composers, although they did pen some sturdy folk-rock tunes. Their strengths lay in the ziplocked tightness of their playing and arrangements; their ability to whip up a psychedelic brew from a diverse pool of sources encompassing folk, blues, improvisational jazz, and even Spanish and classical guitar; and their inventive rearrangements of unexpected, even left-field, blues, R&B, folk, and jazz classics. Leading the way was the inimitable, immediately identifiable quaver of John Cipollina's sustain-fueled lead guitar. He was complemented by the support of Gary Duncan, less a rhythm guitarist than a repository of resourceful counterpoint riffs of his own, and one of the most skilled and underrated second guitarists in rock history. 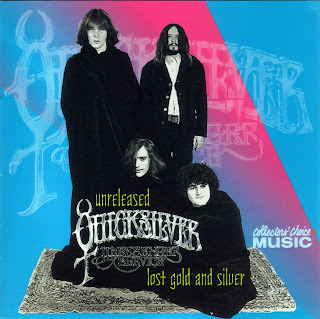 Together with the rhythm section of David Freiberg on bass and Greg Elmore on drums, they comprised the Quicksilver lineup that played on the band's first two Capitol albums, Quicksilver Messenger Service (1968) and Happy Trails (1969)--albums that, by virtual consensus, represent the best work that any configuration of Quicksilver released. As popular as those records are, they convey an incomplete picture of the band as they sounded at their peak. Tapes of numerous Quicksilver concerts from the sixties, some from as early as 1966, circulate among collectors as testaments to the musicians' onstage force, also containing several songs, particularly blues and R&B covers, never released by the band on their early records. Quicksilver also did quite a bit of studio work in this era that never saw the light of day, including alternate versions (sometimes multiple alternates) of songs from their self-titled debut, and an assortment of covers (again mostly of blues/R&B tunes). In addition to an early demo session for Vanguard, the band cut quite a bit of unused material circa 1967, around the time they were preparing their debut Capitol LP. The Unreleased Quicksilver Messenger Service: Lost Gold and Silver finally allows us to hear about two hours of previously unreleased live and studio recordings from Quicksilver's golden era, along with four studio cuts of the period that eluded those first two albums, surfacing on a soundtrack album and a 1968 non-LP single. The bulk of this collection is devoted to the previously unissued live Quicksilver recordings, taken from 1968 performances, that comprise the first disc of this package. Considering that these were not taped with official release in mind, the fidelity is astoundingly good. Indeed it's about on par with the sound of the live material on Happy Trails, and the song selection is arguably superior to what was chosen for that record. Unquestionably it reflects a wider slice of the band's repertoire than Happy Trails does, with the addition of several blues classics that the band did not include on their first two albums, and live versions of songs from the Quicksilver Messenger Service LP. It's the blues that kicks this CD off, as the band sinks their claws into Howlin' Wolf's "Back Door Man." This was covered by several groups in the 1960s, most notably the Doors, who chose it to lead off the second side of their earthshaking debut album. When tackling blues standards such as these, Quicksilver did not have the kind of vocal firepower that could compete with the likes of Jim Morrison or Mick Jagger. Their interpretive stamp was most visible in the guitar arrangements, and the group's crunching axework turns "Back Door Man" into a stomping rocker with start-stop rhythms that shows more of their garage band roots than were audible on their proper studio releases. Howlin' Wolf also gets the psychedelic blues treatment with their extended workout on "Smokestack Lightning," a tune sixties rock groups loved to improvise upon from the time the Yardbirds recorded their live version with Eric Clapton on lead in 1964. If the blues was one major pillar of the Quicksilver sound, folk music was another, particularly via the influence of David Freiberg, who had played folk music before joining the band, and folksinger Dino Valenti, who might have been a founder member of Quicksilver had he not been busted before he had a chance to rehearse with them in the group's embryonic phase. Folk, blues, and hard rock meet head on with the band's interpretation of Buffy Sainte-Marie's "Codine," done (surprisingly, considering its overt drug references) by a number of mid-sixties folk-rock bands, including one of Quicksilver's San Franciscan psychedelic neighbors, the Charlatans. The band would put a studio version of the song on the Revolution soundtrack (see disc two). This live rendition gives full vent to the anguished vocals and guitar that changed the song from a stark folkie lament to a wrenching blast. The foursome adopt a nastier, punkier edge than many would have believed possible given their reputation as a hippie outfit. Quicksilver do four of the six songs that comprised the Quicksilver Messenger Service album on the live portion of this disc, omitting only "Pride of Man" and "Too Long." The live passes through "Gold and Silver," "Light Your Windows," "Dino's Song," and "The Fool" are similar to the studio takes, proving how capable the band were at replicating the exacting arrangements of the first LP onstage, adding an oh-so-slightly rawer, more spontaneous feel. "Light Your Windows" and "Dino's Song" are outstanding illustrations of the group's overlooked knack for melodic and tender harmonized folk-rockers. "Dino's Song" was written by Dino Valenti, by this time out of jail and pursuing a solo career; in 1970 he finally did join Quicksilver Messenger Service for real, in so doing greatly influencing their shift to a more laid-back, singer-songwriter-oriented style. "Gold and Silver," the instrumental based around a riff lifted from Dave Brubeck's jazz hit "Take Five," does differ from the Quicksilver Messenger Service version with the insertion of a lengthy drum solo by Greg Elmore. "The Fool," early Quicksilver's lengthiest and most complex (not to mention most lyrically cosmic) original composition, is a bit heavier on the electric guitar parts than its studio counterpart. Dogs and cats shall scurry from the room during the vocal section when it is attempted, without total success, to reach the piercingly high note of the "heavens above" lyric. As compensation, Cipollina uncurls some stratospheric vibrato sustain as the song reaches its majestic conclusion. Happy Trails is most famed for its elastic transmogrifications of "Mona" and "Who Do You Love," in which these Bo Diddley warhorses were stretched almost beyond recognition into psychedelic jams. The band treated these not as straight R&B covers, but as very loose templates upon which to hang long instrumental guitar improvisations, the tempo and the melody of the original tune all but disappearing for lengthy passages. New concert performances of both songs appear here, although "Who Do You Love," which clocked in at a whopping 25 minutes on Happy Trails, is halved in length (and quartered on the studio version that appears on this anthology's second disc). "Mona," which weaves in and out of the more abstract Gary Duncan composition "Maiden of the Cancer Moon," holds some of the band's more inventive guitar duels, prefaced by some eerily high-pitched distortion at the very beginning of the track. 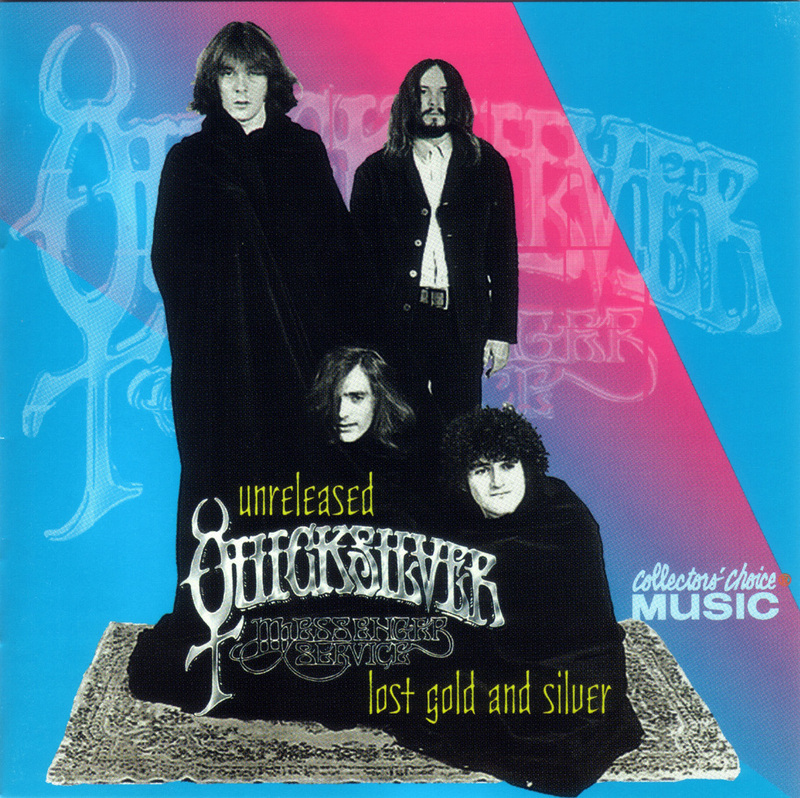 As a bonus to the live 1968 material, The Unreleased Quicksilver Messenger Service: Lost Gold and Silver also includes an entire disc of previously unreleased and rare studio tracks, all recorded circa 1967-68. The eight previously unissued songs probably all date from 1967, when the band did quite a bit of recording in advance of the release of Quicksilver Messenger Service, as demonstrated by the existence of alternate versions of all six of its songs on various bootlegs. Only two of the studio cuts included here, however, would be redone for the first album. The early version of "Dino's Song," also titled "I Don't Want to Spoil Your Party" (as it was when the Byrds did an unreleased cover of the tune in 1965), was recorded on November 13, 1967, boasting an arrangement that was pretty close to the one used on the LP. That wasn't the case, however, with the take of "Gold and Silver" (at that time titled "Acapulco Gold and Silver") that was recorded the same day. It features a prominent harpsichord part that was entirely discarded in the released take, adding to the quasi-classical vibe of the melody. And get a load of that Ennio Morricone-styled whistling throughout, another idea that ended up on the cutting room floor, to be replaced by glistening Cipollina leads. The six additional unreleased studio tracks do include two songs that made it onto Happy Trails in radically different, lengthier versions. "Who Do You Love" gets compressed into six minutes in its studio incarnation, offering a far more concise and conventional interpretation (including harmonica) of the number than would be heard on the famous 25-minute sprawl that took up the entire first side of the Happy Trails LP. The Gary Duncan-composed "Calvary" is a real standout, gaining in impact and pungency in its reduction from the 13-minute Happy Trails version to the six-minute one (probably unfinished, judging from the occasional sudden pauses) presented here. 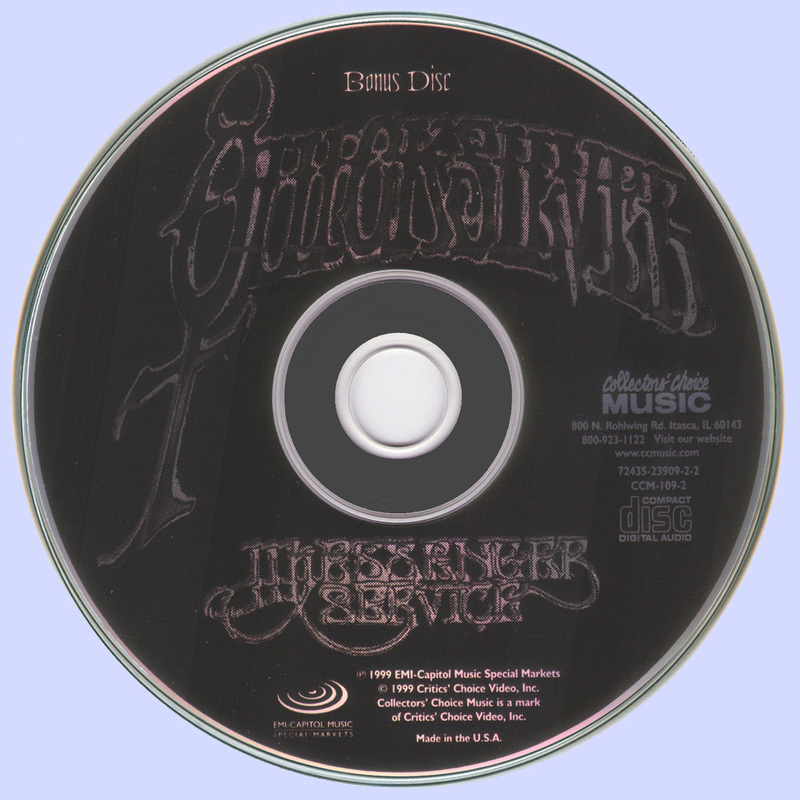 It's an outstanding example of how interesting Quicksilver could be when they strayed outside blues-rock boundaries. Its mysterious tinkles and hollow, haunted wordless vocals embellish a tune that owes more to Spanish folk guitar than rock'n'roll, evoking the Old West in its barren, windswept glory. The riveting "I Hear You Knockin'," a minor-keyed R&B number, was a notable loss from the first album, decorated by some superbly sly and menacing Cipollina licks. This is not the famous New Orleans R&B classic that was first sung by Smiley Lewis and taken to the Top Five by Dave Edmunds in 1971, but an entirely different tune, thought by Freiberg and Duncan to have probably been based on a version by Ray Charles. It and "Back Door Man" have horn charts reminiscent of the brassy arrangements employed by the Electric Flag at the time, an approach that was largely dropped on the Quicksilver Messenger Service album (with the exception of "Pride of Man"). A hornless version of "I Hear You Knockin'," probably from the same era, did finally appear on Rhino's Sons of Mercury Quicksilver compilation in 1991. There's also a straightforward rock cover of Robert Johnson's "Walkin' Blues," whose arrangement is not too different from the one the Paul Butterfield Blues Band had offered on their 1966 East West album. "Your Time Will Come" was originally done by Mose Allison as the far jauntier "If You Live"; like "I Hear You Knockin'," it's indicative of the band's taste for mixing blues and melancholy melodies. The harmonica on "Your Time Will Come" and "Who Do You Love" indicates that those tracks might have been recorded with Jim Murray, a founding member of Quicksilver who sang and played harp with the band until leaving sometime in 1967. Our tour through the Quicksilver vaults ends with four studio tracks that did not appear on Quicksilver Messenger Service or Happy Trails, although they feature the same personnel that played on those records. "Babe, I'm Gonna Leave You" (originally by Erik Darling) and the studio version of "Codine" were recorded in one day for the Revolution movie, whose soundtrack also included material by two other emerging Bay Area acts, the Steve Miller Band and Mother Earth. Both of these folk songs entered Quicksilver's repertoire via Freiberg, and the band do an excellent job of adapting them into lean, devious, acid-tinged folk-rockers. "Stand By Me" and "Bears" were issued as a single in 1968, exhibiting a lighter side of Quicksilver than was apparent on any other of their early outings. "Bears," learned by Freiberg from folkie Roger Perkins, is undoubtedly the most atypical song early Quicksilver attempted, and more like a goofy kiddie singalong than a rock tune. Duncan, in fact, told writer John Barthel that "Bears" came about because "we wanted to do something for our little kids"; that's Electric Flag singer Nick Gravenites doing the bear noises. The more serious "Stand By Me" was written by the erstwhile Dino Valenti, its laid-back folk-rock ambience anticipating the mellower path Quicksilver would take after completing their Happy Trails. Quicksilver would continue to enjoy some popularity in the early seventies, as the arrival of keyboardist Nicky Hopkins and then singer-guitarist Dino Valenti altered the band's vision toward more pastoral territory. They were most innovative, however, when Cipollina and Duncan wove their guitars together in some of the finest psychedelic rock ever laid down, and the band managed to take some of the best elements from an array of disparate influences to create something new and intoxicating. The Unreleased Quicksilver Messenger Service: Lost Gold and Silver, which approximately doubles the size of the 1967-68-era Quicksilver's discography, goes a long way towards documenting the band's prime with the justice they deserve. Thanks - will try again, though file sizes look complete. Tim go to chat box, and leave a message there. Maybe you should diasble for a while your adblocks. I don't know what to say, for over hundreds of d/loads, only you mentioned problem for the specific release, if I can get somehow your e-mail I can send it directly, no passwords and in one file.